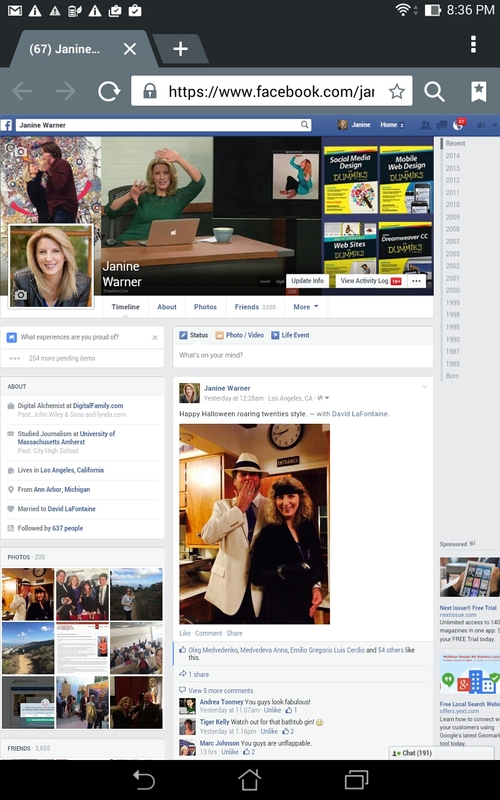 The biggest challenge with designing a great Facebook profile today is that your design (and the position of your images) changes depending on the screen size. That’s why I created my new Facebook template — because a design that looks great on your desktop computer can look terrible when it severely cropped on a smartphone. Check out the screenshots of my own profile to see an example of how differently your profile appears on smaller screens. 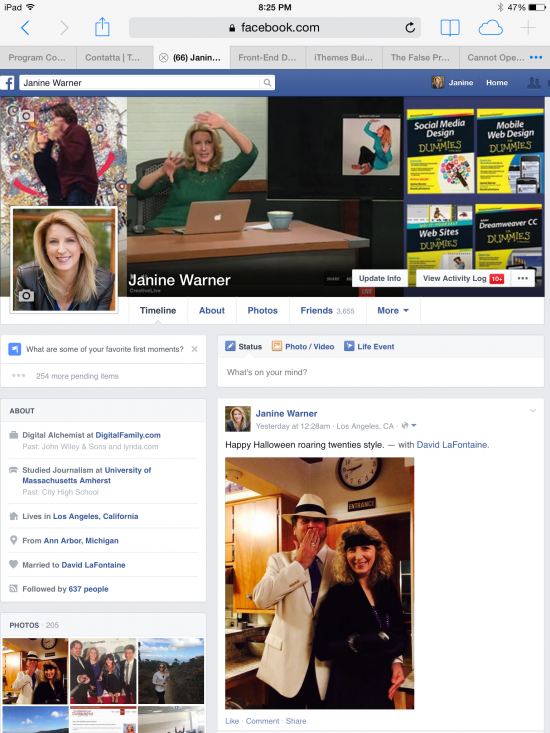 Janine Warner’s Facebook profile displayed on an iPhone 5S in landscape view (horizontal). After testing on many different devices, the most severe cropping occurs on smartphones when a profile is displayed in landscape (or horizontal) view. The same profile design is shown below on a desktop computer monitor. Notice that the banner image is not just cropped on the left and right, but also across the middle. If you’ve only ever seen your profile on a desktop computer, you may be seeing a lot more than the rest of your visitors. 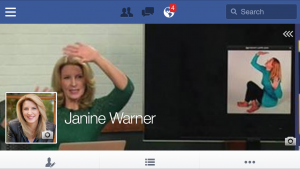 Janine Warner’s Facebook profile displayed on a 24 inch desktop monitor in Google Chrome on a Mac. How do you design a profile that looks good on small and large screens? To download the full size version of this template in JPEG format, click on it to view the larger version, then right-click on that version and choose Save Image. If you want the layered PSD version, please order my complete Social Media Design Template Kit, which includes templates for four of the top social sites: Facebook, Twitter, Google+, and YouTube. 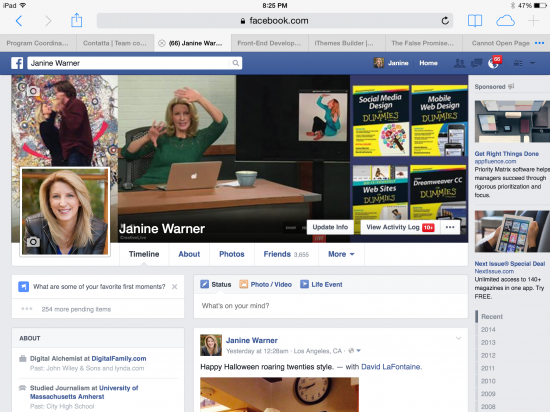 Want to learn more about social media design? Watch my CreativeLIVE course on Social Media Design. Order my complete Social Media Design Template Kit, with templates for Facebook, Twitter, YouTube, and Google+. In portrait view on a smartphone the banner image is only cropped on the left and right. 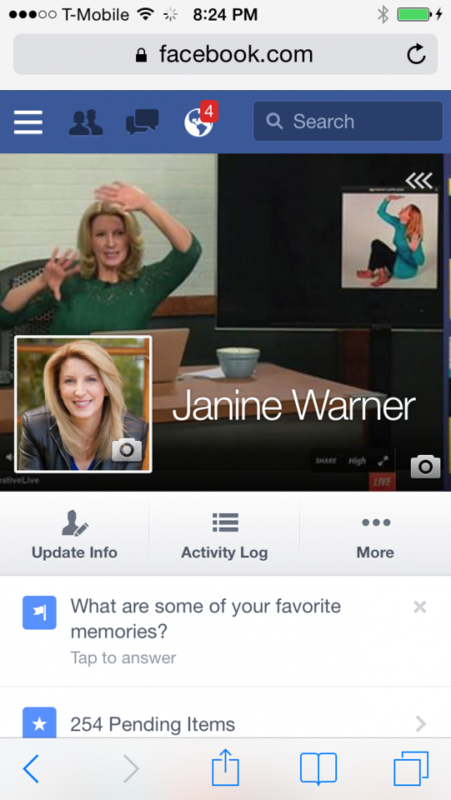 Janine Warner’s Facebook profile displayed on an iPhone 5S in portrait view (vertical). On the iPad (and other tablets tested), there is no noticeable cropping in portrait or landscape views. 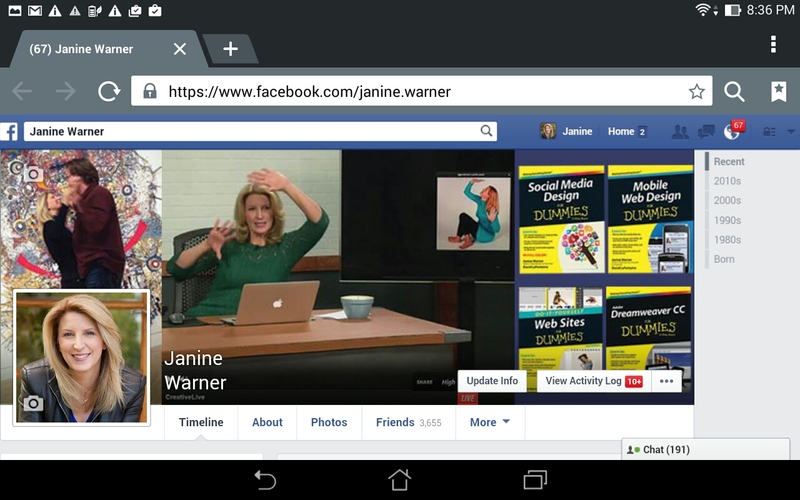 Janine Warner’s Facebook profile on an iPad in landscape view. Janine Warner’s Facebook profile on an iPad in portrait view. On the ASUS Android tablet (and other tablets tested), there is no noticeable cropping in portrait or landscape views. On the ASUS tablet (and other tablets tested), there is no noticeable cropping in portrait or landscape views. On the ASUS tablet (and many other tablets tested), there is no noticeable cropping in portrait or landscape views. To download the full size version of this template, click on it to view the larger version, then right-click on that version and choose Save Image.